Timelog data for additional Invoice: In this example Invoice# 8125 exists for the displayed Timelog. When the user presses New Entry, a popup menu appears allowing the user to create an entry for the current Invoice, or start an "Entry for New Invoice." Selecting "Entry for New Invoice" will result in new "UnInvoiced" entries for the Timelog. 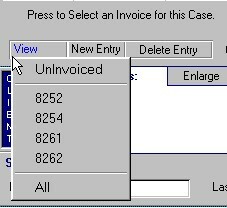 These UnInvoiced entries will be included in the next Invoice created for the displayed case. A View button (shown on the right) has been added to the Timelog form. Whenever multiple Invoices exist for a Case this button will be enabled. Pressing this button will display a popup menu allowing a user to select Timelog data for any Invoice for the displayed case. In this example, there are four Invoices that have been previously issued. The UnInvoiced entry is to view "new" Timelog data, (to be invoiced). The "All" selection is to allow a user to view ALL Timelog data at once for the displayed case.